By 2050, around 16% of Americans age 65 and older are projected to have Alzheimer's disease. 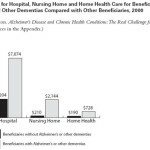 Silver BookBy 2050, around 16% of Americans age 65 and older are projected to have Alzheimer’s disease. By 2050, around 16% of Americans age 65 and older are projected to have Alzheimer’s disease.